Notes only from Mon. to Fr. In case of rough seas: before departure, we suggest you contact the ferry company by telephone (see number in the sidebar) to check on scheduling changes or cancellations. You will also find all ferry company updates on the site NaplesBayFerry. Ferry routes run during the tourist season from the beginning of April through October. During the winter months, the only ferry routes ative are those between Sorrento and Naples, and Naples or Sorrento and the islands. 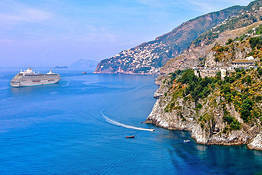 Unfortunately, there are no direct ferry routes which connect Naples and the Amalfi Coast. 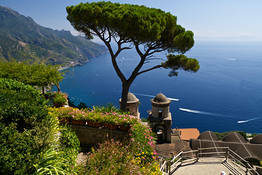 The Sorrento - Positano - Amalfi route usually runs from mid-May. 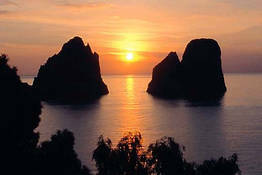 There are no direct routes connecting the Amalfi Coast and the island of Ischia. Prices refer to a single, one way ticket. Children under 3 travel free. There are discounts available for children under 12. Luggage can be transported on the ferry, but there is a surcharge of €2 per bag. We suggest you pre-purchase your tickets for travel during the months of July and August, on holiday weekends, and for routes to Capri. If you have purchased your tickets online, you will have to present your voucher at the ferry ticket window to receive your tickets. You can also purchase ferry tickets in advance directly at the port. In Salerno, there are two ports of departure: Piazza Concordia and Molo Manfredi. Piazza Concordia is directly across from the train station where the high speed trains arrive; Molo Manfredi is a few kilometers away. The Amalfi port for all ferry arrivals and departures is Molo Pennello in the town center. In Positano, the ferry pier is located at the Spiaggia Grande beach. If your hotel is located in the upper section of town, we do not suggest arriving by sea, as there are no roads connecting the pier and the highest secgtion of town, but only flights of stairs. Regardless, there are luggage porters available at the pier. Vehicles cannot be embarked on ferry routes to and from the Amalfi Coast. There are a number of public parking lots in Salerno where you can leave your vehicle. In case of rough seas, routes may be suspended. Reserve and purchase your tickets now to lock in availability. How about a boat ride along the breathtaking Amalfi Coast?